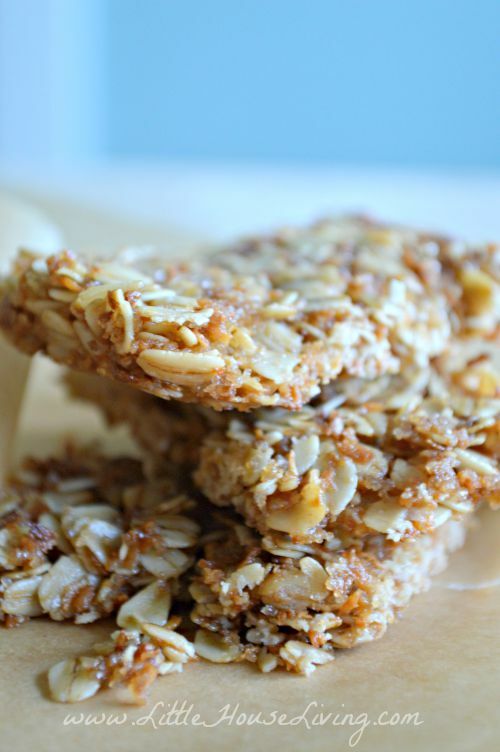 I’m always looking for snacks that I can make quickly that my little ones will enjoy. It seems like store bought snacks are so expensive and if your kids eat as much as mine do (no idea how I’m going to feed them when they are teenagers…you should see how much food the one year old can put away!) you are looking out for homemade snacks too! 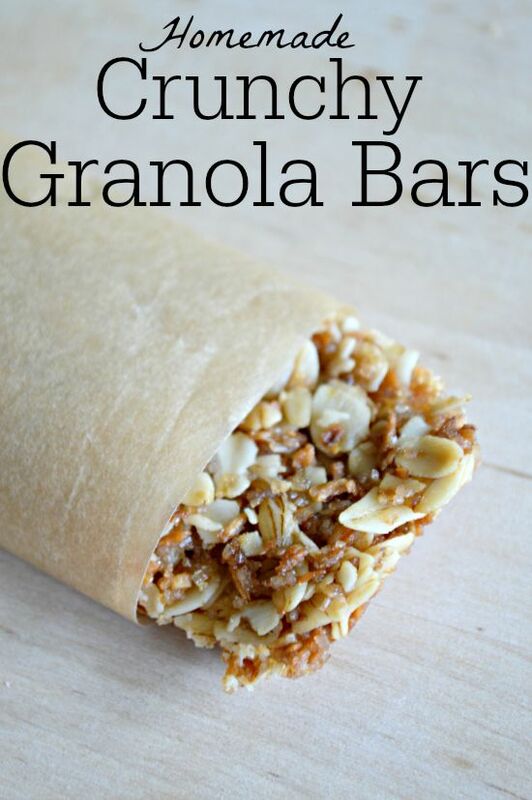 I used to love those crunchy pre-packaged granola bars back when I still ate that kind of thing, but since I discovered my allergies those have disappeared from my pantry. 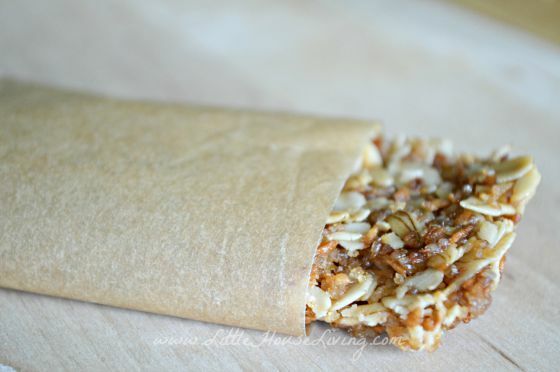 However, this recipe is a great alternative and is super easy and fairly inexpensive to make! Add in the sugar, maple syrup, and vanilla extract. Stir until combined as well as possibly with the oil. Add in the coconut and oats and stir until everything is coated with the oil mixture. Place a piece of parchment paper into a 9×13 baking dish. 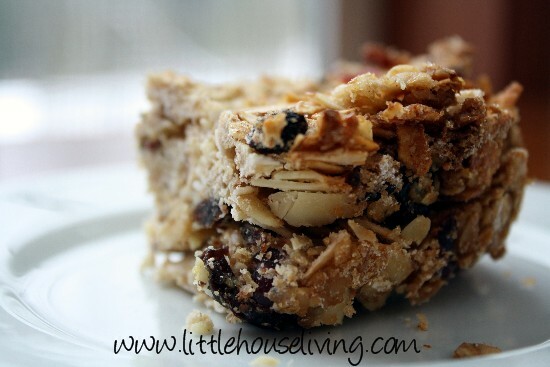 Spread the granola mixture into the pan and press the mixture down to pack it as firmly as possible. Bake the mixture at 375 degrees for 10 to 15 minutes or until it looks browned and slightly bubbly. Remove from the oven and let the bars cool. After the bars have cooled you can cut into pieces. Not all pieces may be perfect since these are the crunchy kind they are a bit hard to cut. They still taste the same, I promise! Store these in the fridge or on the countertop in an air tight container. Eat within a week or two of baking. 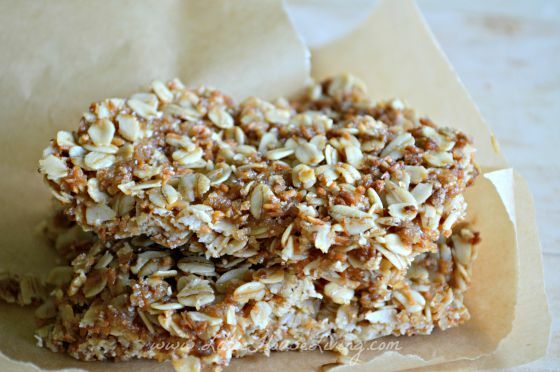 What are some of your kids favorite snacks that you make? This is exactly the kind of recipe I have been looking for! Thank you! I need to pin this my kids love the store bought kind. They are so expensive though and filled with who knows what! These bars look and sound awesome. Definitely on the baking schedule this weekend. Plus, everything I need is already in the pantry. Hey, these taste wonderful but how do I get them to stick together in bars? Mine broke all to pieces when i cut them and took them out of the pan. I have everything on hand! I think I’ll make these today! Oh My Goodness!!! these taste Amazing!!!! It’s all I can do not to eat the entire pan! Great recipe, thanks so much! I used a pizza cutter and pressure to cut up the batch. Sounds easy enough and I’ve most of the ingredients… would want to try it out!